JOHANNESBURG – No matter how much the United States continues to emerge as a competitive World Cup nation, there is little doubt that the international perception of American soccer will always be doused with suspicion. Why? Because Americans don't even call the sport by its proper name, of course. They don't call it "football." They call it "soccer." In the USA, football is that game that dominates winter Sundays and features Lycra, helmets and men so large they should come with their own zip code. Elsewhere, football is football. 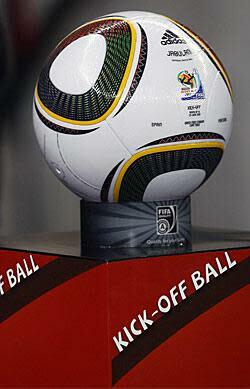 The round-ball sport, the beautiful game, with its biggest prize to be handed out here on July 11. Soccer? Pah, a silly American term created by a nation that has its own national obsession. No country has been snootier toward the USA's use of the term "soccer" than England. Before the Group C opener between the two sides in Rustenburg, the Sun newspaper even ran a spoof front page urging Fabio Capello's side to win the "soccerball world series." But let's take a halftime break here. Coupled with their team's humiliating exit from the World Cup it might be another rude awakening to the Brits that soccer isn't an American term, it is actually an English one. And it isn't some modern fad that shows disrespect to the world's most popular sport, it dates back to the earliest days of the game's professional history. Indeed, until the last few decades, even Englishmen would routinely refer to their favorite pastime as soccer, just as often as they would say football. Clive Toye, an Englishman who moved to the U.S. and became known as the father of modern American soccer, bringing Brazilian legend Pele to play for the New York Cosmos, takes up the story. "Soccer is a synonym for football," said Toye, who helped launch the North American Soccer League in the late 1960s. "And it has been used as such for more years than I can count. When I was a kid in England and grabbed a ball to go out and play … I would just as easily have said: 'Let's have a game of soccer' as I would use the word 'football' instead. And I didn't start it." To trace the origin of "soccer" we must go all the way back to 1863, and a meeting of gentlemen at a London pub, who congregated with the purpose of standardizing the rules of "football," which was in its infant years as an organized sport but was growing rapidly in popularity. Those assembled became the founding members of the Football Association (which still oversees the game in England to this day). And they decided to call their code Association Football, to differentiate it from Rugby Football. A quirk of British culture is the permanent need to familiarize names by shortening them. "My friend Brian Johnston was Johnners," said Toye. "They took the third, fourth and fifth letters of Association and called it SOCcer. So there you are." So forget that English condescension and carry on calling it soccer, safe in the knowledge that you're more in tune with the roots of the sport than those mocking Brits.